John Petersen forecasts that in the next 10 years, that we’ll have 80 times more advancements than we did in the past 100 years! Each “quantum leap” throughout history is followed by another acceleration in knowledge and understanding that happens in one-tenth the time of the previous one. If an equal amount of breakthroughs happen in a shorter period of time, that is a power increase. 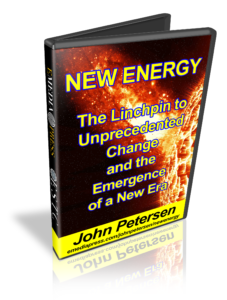 However, things are not only happening faster, there are more of them happening and simultaneously at a faster rate, so both POWER and ENERGY are increasing. This combination points to the fact that we are absolutely moving into times that are completely unprecedented! Natural rhythms and solar cycles are covered in detail as are the two primary things that drive these natural cycles, which are revealed in the presentation. There are sources of energetic changes that we see in our world and in our lives and some of these arise from the influence of the center of our own galaxy, changes the Sun is experiencing, planetary positions and more. We have been moving through an area of space within our galaxy that is influencing climate and other Earth changes, DNA and other possible areas. This is even backed by studies from the Russian Natural Academy of Sciences. The Sun’s magnetic field is slowly weakening and has been for the last eighteen years and this trend is going to continue far past our lifetimes. As this field weakens as it is right now, more solar and cosmic energy is able to penetrate our atmosphere and influence life on Earth. Right now, the amount of cosmic rays that are penetrating our magnetosphere, the magnetic field that shields us from solar radiation, is at an all time high. What kind of influence do these cosmic rays have on life as we know it? NASA and other organizations are starting to more openly admit that these cosmic and solar relationships with the Earth has more of an effect on our climate than was previously admitted. It is interesting to note that the weakening of the Earth’s magnetic field can lead to a pole reversal and recently, it has been discovered and reported in mainstream news that the Earth’s magnetic field can flip within the single lifetime of a person – less than 100 years! That is much faster than was previously believed to be possible. John Petersen also points out 5-6 specific individuals who are or were high ranking in their own respective fields or industries who have come forward to admit that UAP’s (Unidentified Aerial Phenomena) are real and that we have to do something about it. He also covers a bit about the Secret Space Program. This is not a new concept, but when you have someone with John’s background acknowledging this, it’s worth a second look. Reread his bio up above and you’ll have enough reason to give serious consideration to such a discussion. Russian President Vladimir Putin admitted something that is possibly worse than nuclear weapons and John points this out. It was in the news, but hardly anyone noticed. And in the full context of where everything is going, it is remotely related to a new type of human being that is emerging. You’re in for a real surprise when you see this presentation. Some things you will have heard of but quite a bit has not been pieced together so eloquently. John Petersen, the founder of the Arlington Institute, has a much wider frame of reference that most due to his extensive background and what he was able to share with us at the 2018 ESTC was a real gift. If you want to see a path that we are all walking whether we know it or not or whether we want to or not, it is happening and it is happening now.